It takes balls —well, at least, something like that— to call your band The United States of America. And the San Francisco-based eggheads who dared to do so in the late-'60s were doing so with no little irony. At a time in which their country was waging a hated war and opposition to it was steeped in "all you need is love" delusion, their name had a mocking quality to it. It hardly endeared them to the establishment, including their own record label, Columbia. "There was," USA mastermind Joseph Byrd would later recount, "scant enthusiasm from the executives for a band whose name they hated, whose music they didn't understand, and whose politics they thought treasonous." That sense of treason extended to their approach to popular music. 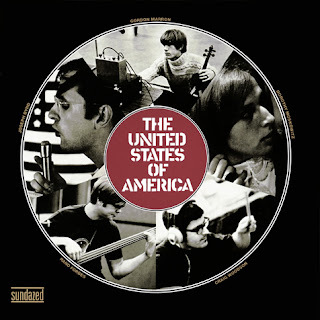 These United States were a band of serious avant-gardists; young composers and scholars who were students of modern-composition titans John Cage and Karlheinz Stockhausen. Even though none had a background —or, even, a sensibility— in rock'n'roll, Byrd decided that they should try their hand at a rockband. And they were like no band ever before assembled. Rather than electric guitar, The United States of America employed a bizarre arsenal of instruments: circus calliope, harpsichord, scrapes of atonal violin, a ring modular, and electronic oscillations all being used to assault the 'sacred' form of the rock'n'roll song. It was part subversion, sure, but The United States of America weren't simple provocateurs. 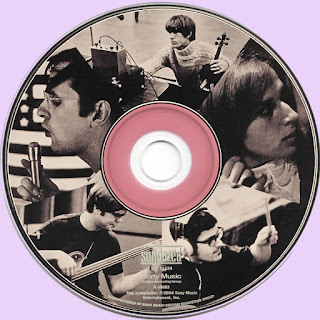 Listening to their one-and-only album —a 1968 self-titled album that sunk quickly without a trace— and what stands out isn't its sense of invention or its preponderance of experimentation, but the way that its experimental edge works with its surprising, charming tunefulness. Whilst The United States continually deconstruct the sanctity of songs —passages of white noise, eerie atmospheres, and cacophonous collage derailing the forward progression of verse/chorus— they don't shy away from the sweetness of songcraft. With Dorothy Moskowitz's voice as their most melodic instrument, Byrd and his crew composed tunes that were tuneful; be they raucous, psychedelic rockers, or eerie, barely-there lullabies. Since this album has been rediscovered by a new generation, it's those sparse songs that've most entranced modern audiences; the marriage of Moskowitz's gentle singing, scrapes and wails of Gordon Marron's violin, and sci-fi squalls of electric circuitry make for most modern-sounding compositions on cuts like "Cloud Song." The influence of the spectral side is apparent on their biggest new-millennial boosters, Broadcast, the amazing English electro minimalists who've cited The United States of America as their chief influence. In many ways, this album makes more sense over 40 years on than it would've in its day; even if the band were an obvious product of their era. For all who love the 60 and 70 is a real treasure,time has stopped in one place...nice memories!This is a true masterpiece from beginning to end!Possibly the greatest album in the entire US Psychedelic scene and one of the greatest in the history of all Rock! Thank you Marios, I have been delighted by your offerings over at OldRockerBR's wonderful Blog, where you are a frequent contributor. This is a true masterpiece,had this album years ago but lent it to someone and it's gone. But can now upgrade from @256 mp3 i got from "Chrisgoesrock" site of old. Thanks for the share,keep well !. Sorprendente, y de muy buen gusto, No sólo me quito el sombrero, sino que además hago una reverencia ante este disco que exige respeto, mucho respeto. Temas que sobresalen del propio disco. Otra genialidad de estos maravillosos años, que musicalemente hablando son único. Gracias Marios, otro disco que enmarco (esto será mi ruina). M, can you re-up this? Thanks. Great upload! Thank you so much, what is th pw to open the archive?